Combine buttermilk, salt, smoked paprika, hot sauce and black pepper. Add chicken. Refrigerate, covered, and let marinate for at least 6 hours or up to 24 hours. Preheat oven to 425°F. Set a rack over a baking sheet lined with foil. Spray rack generously with cooking spray; set aside. Season chicken all over with salt. 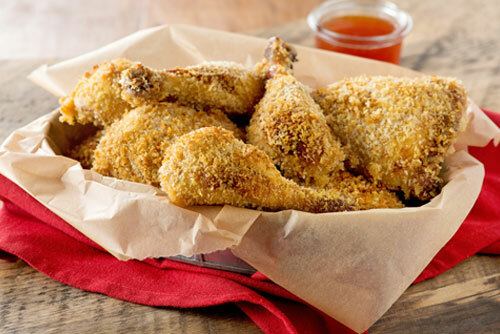 Coat chicken pieces in panko breadcrumbs. Place coated chicken on prepared rack. Spray chicken with cooking spray. Bake until the coating is browned and an instant-read thermometer inserted in the thickest part of the pieces registers 160°F, 40 to 45 minutes. Serve these legs with honey and hot sauce for sweet and spicy dipping sauces. Substitute smoked paprika for regular paprika if it is more convenient.